An unassuming storefront along Los Angeles’s bustling West Third Street is a creative way-station for those in the know. Freehand Gallery has been in business since 1980, the carefully stewarded brainchild of Carol Sauvion. Its longevity is a remarkable tribute to the enduring power of craft as an aesthetic and cultural force. As you step through the door, a welcoming sanctuary of handmade contemporary craft offers a respite from the turbulence of life outside its walls. Large windows, in which ceramics, sculpture and other fine works reside on a temporary basis, let in the soft Southern California light. It is an unassuming, unpretentious space and one that invites you to enjoy its offerings in a comfortable, relaxing atmosphere. One can slow down here and take time to enjoy the creative endeavors of artists from all over the country. Throughout the year handmade objects spill over shelves, tables, counters, and displays—a rich tapestry of all the craft media—ceramics, metalwork, decorative fiber, glass, and jewelry. However, each spring, Freehand is devoted to jewelry and the pace of the gallery quickens. From April 21 through June 2, 2018, this year’s annual jewelry show, entitled “Back Again, Forever,” focuses on the way jewelry evokes memories, even imagined ones, of times long past, inducing reflection on possibilities yet to come. The eleven jewelers and one clothing maker who were selected create a synthesis between the traditional and the contemporary, each with their own way of paying homage to artists of earlier eras. Roberta and David Williamson, who have been making jewelry together since the 1970s, have a strong and familiar connection with memory. Their work often includes lithographs, a moment frozen in time, harkening to a bygone age. Yet their intent is not to be held back by the past, to dwell in an imagined history that is frozen and unchanging. Rather, their jewelry seeks to connect the past and present, reminding us of those perfect moments that existed then, and still exist now. The connection between past and present can be interpreted in many ways, some more abstract than others. Raïssa Bump is fascinated by texture. Miniature pearls and seed beads are woven into or adorn the surfaces of many of her brooches, necklaces and earrings. This constant finds itself expressed through many variations, and the results often find a way to echo our primeval beginnings. A bracelet, featuring half-moons of silver and a loose chainmail of wire strung with golden beads, calls to mind European filigree. Nevermind that the method she employs deviates in some important ways to that ancient technique—memory is a strange animal, a carnival hall of mirrors that even though refracted recalls an impression of the original. Traditional culture is also a method of remembering. Puerto Rican Maru Lopez moved to the mainland and now resides in San Diego. 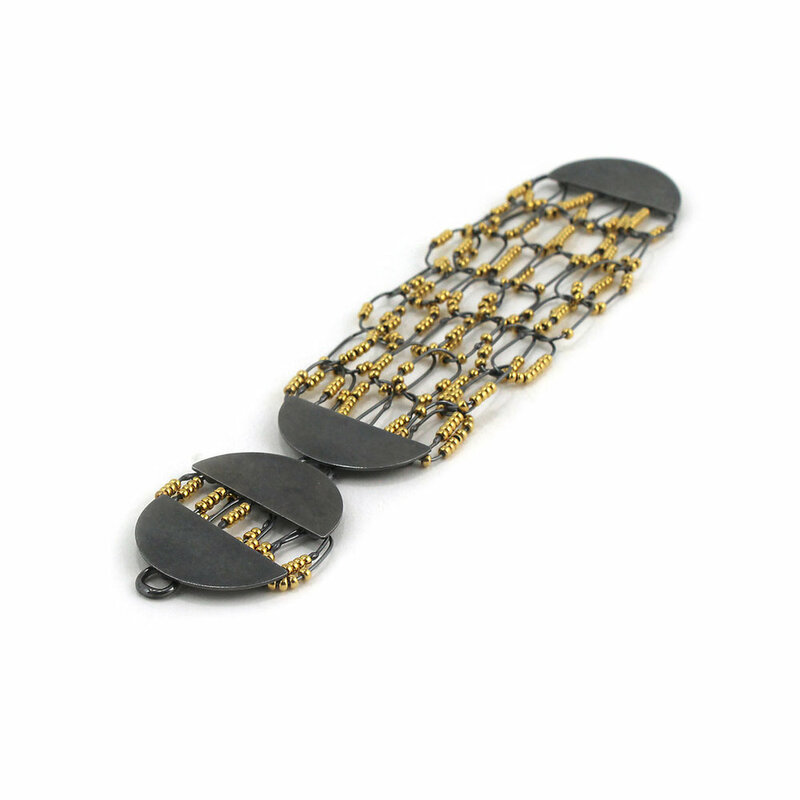 She takes inspiration from ancient Central American jewelry, using primarily nonprecious metals such as brass to provide the golden glitter that was so prized among precolumbian peoples. 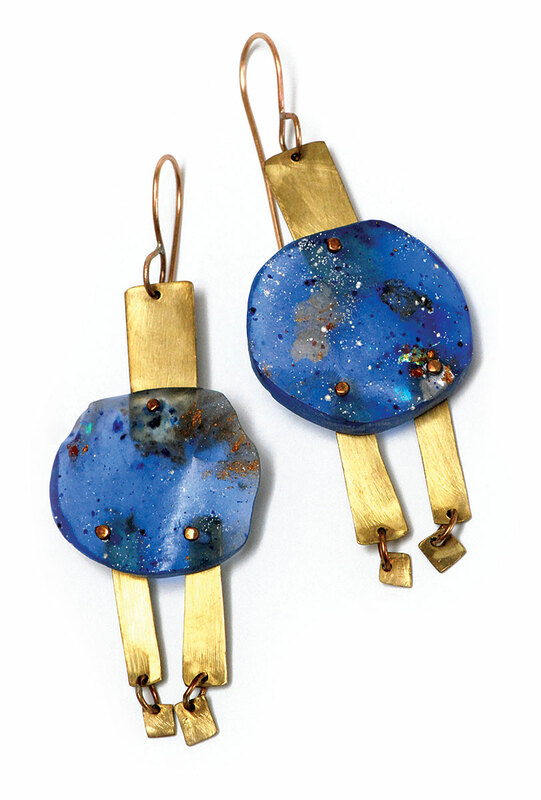 Her own contribution to that creative lineage is the use of hand-dyed resin, self-made gemstones as it were. The work she does is both preservation, and play. 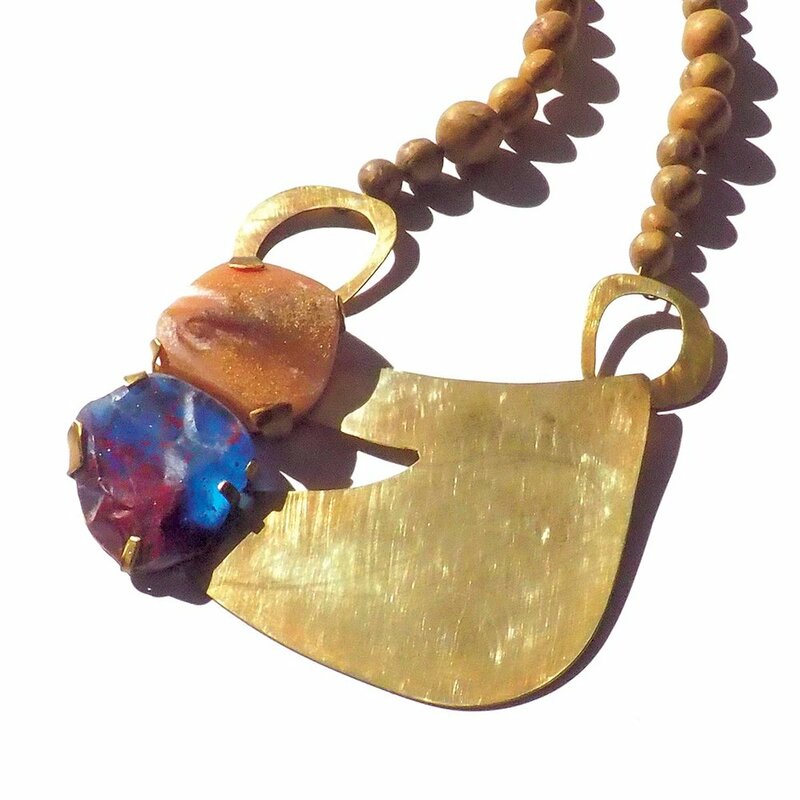 Kathlean Gahagan also honors the past through her jewelry. As the daughter of Jewish and Irish parents, she fuses together both heritages in her brooches and pendants. Incorporating Celtic runes, Hebrew script and other symbols native to the two cultures, her interpretative work has kinship with ethnic jewelers for whom these emblems make up a visual lexicon. Each speaks to the viewer in a similar fashion, by employing a common tongue which stirs feelings of belonging and shadows of understanding. As curators of craft, galleries are a stage upon which the artists being featured are the actors. But the setting can be equally important. Galleries are more than just entrepreneurial exercises, when managed correctly, and Freehand is an example of that. They provide a human connection that elevates the artwork being sold, allowing you to interact with the work, and with the gallery staff who can relate the history behind each piece. Freehand has embodied these qualities, honoring craft with its roots in function and purposeful making, throughout its thirty-eight-year presence in the craft field. The “Back Again, Forever” show illustrates this by being both venue, experience and source. The gallery’s openness (except when filled with jewelry enthusiasts and onlookers) and receptive environment are an invitation to take pleasure in just observing. And perhaps, buying, if what you see calls to mind a memory, whether of the past, or something subtler still. Patrick R. Benesh-Liu is Associate Editor of Ornament and continues to find time to enjoy craft in between writing, travel and tech support. As a former resident of Los Angeles (albeit only as a toddler), the City of Angels holds a certain sense of nostalgia, in particular one of its oldest purveyors of fine craft, Freehand Gallery. 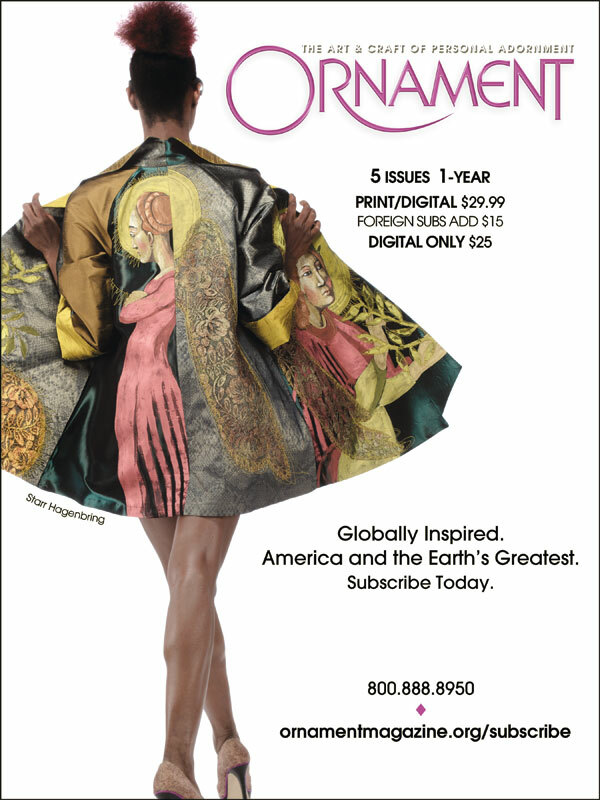 This issue he takes the reader through its annual jewelry show, where an eclectic assortment from the bright and bubbly, to the sedate and contemplative, brings the world of studio art jewelry to Southern California. As Ornament’s reporter, he also provides a zesty compilation of the latest news in craft.